Built 1903. Architects, Patton and Miller, Chicago, Illinois. Contractor, Hoeppner-Bartlett Company of Eau Claire, Wisconsin. 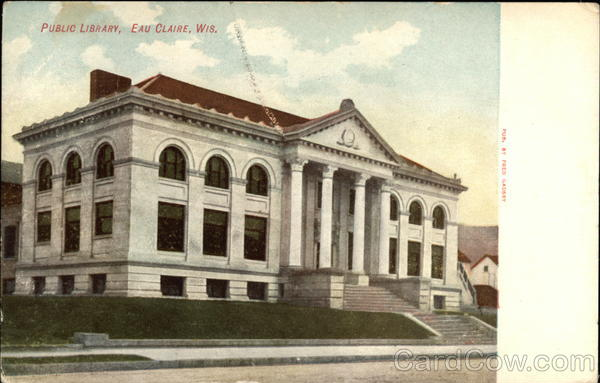 This building was a gift to the City of Eau Claire by Andrew Carnegie. The marker is located on northbound South Farwell Street, north of its intersection with East Grand Avenue, at 217 South Farwell Street, Eau Claire, Wisconsin 54701. A Carnegie library is a library built with money donated by Scottish-American businessman and philanthropist Andrew Carnegie. A total of 2,509 Carnegie libraries were built between 1883 and 1929, including some belonging to public and university library systems. 1,689 were built in the United States, 660 in Britain and Ireland, 125 in Canada, and others in Australia, New Zealand, Serbia, the Caribbean, Mauritius, Malaysia and Fiji. The foregoing text available under the Creative Commons Attribution-ShareAlike License; additional terms may apply. The building is listed on the National Register of Historic Places: Wisconsin: Eau Claire County. This property is designated a City of Eau Claire "Historic Building"; the marker is one in a series of markers erected by the City of Eau Claire Landmark Commission.